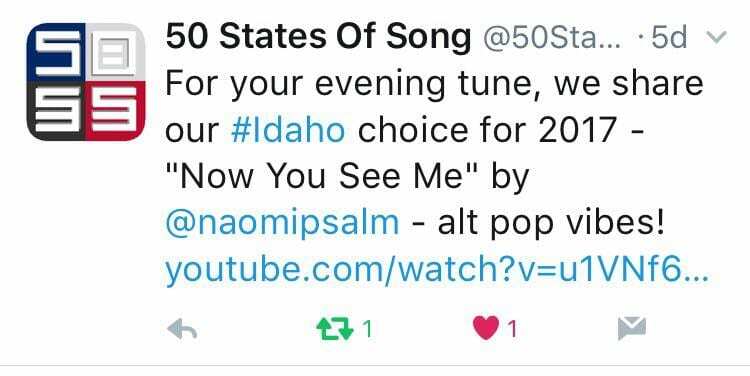 I saw a post on Twitter, and quickly recognized the artist, Naomi Psalm, a local Boise musician, and friend. So I decided to sit down with Naomi at The Local, a fantastic local lunch spot and a go-to for meetings, to talk about her music, career, and what might be next for her. The things I found out were pretty amazing. Empathetic even as a child, Naomi started writing poetry when she was just eight years old. “It was some pretty deep stuff, even then,” she told me. She grew up in Florida and moved around a lot, even internationally before settling in Boise. Naomi traveled a lot and was in Taiwan for six months at 14. She helped teach Taiwanese children English. At 19, as a part of YWAM (Youth with a Mission) she began working on a hospital ship, and for three years was the songwriter and bass player with the band on board. Naomi has several singles available on ReverbNation, iTunes, Amazon, and you can also find her on Soundcloud. Besides playing solo gigs, she loves to collaborate with other musicians when she gets the chance. “I love to play with a full band,” she told me. “It is so fun to interact with the other musicians on the stage.” When the opportunity comes up, she has several band members she plays with, pulling together whoever is available at the time. Genre? Please. Psalm’s soulful voice lends itself to many. From her own folk rock to a blues type collaboration with Ryan Bayne, her voice seems to adapt to a number of styles. However, she doesn’t limit herself to just those styles. Recently, Naomi collaborated with hip-hop artist eLAyCee~SSF on their album Visions. She sang on several tracks, including “War”, “Until the End”, and the title track “Visions”. Also like many other artists, Naomi has dealt with depression. For her, music is cathartic and provides an outlet to deal with it. Her single “Shelf Life” talks a little more directly about the ups and downs that come with depression, something many of us can relate to. This empathetic tone, the same one that inspired her poetry as a child, runs throughout her original songs and is a hallmark of her musical style. Not that her music is depressing: far from it. There is an amazing depth in her songwriting that resonates with the soul. Finding a musician of this caliber with this kind of experience is amazing, especially when you sit down and talk with her, you’d never guess it. Naomi Psalm is kind, quiet but not too quiet, and a person who is easy to talk to and get to know. If you’ve discovered Naomi Psalm, you know that her songs are much richer than her demeanor would portray, and the powerful vocals that pour out when she starts to sing are almost unexpected after you’ve met her in another setting, away from the stage and the lights. Check out Naomi online on Facebook and Twitter, watch her on YouTube, listen on Soundcloud and ReverbNation, and buy her tracks on iTunes and Amazon. Catch her at Boise Music Festival, and support your local indie artists and musicians. Are you a local artist who would like to be featured on Unbound Northwest, or do you know one? Contact us here.